Cold River Soap Works New Shaving Soap! Thanks to my rss feed I was able to get the news about CRSW's new soap from their blog. Wednesday can't get here soon enough! Can't wait for this release! I wonder what the scents will be? I just got the email. Looks like a shaving cream and not a traditional tub of soap. I am very interested! I hope I can score some! I was lucky enough to be a tester for this soap. Here are a few thoughts for those wondering about this next release. First of all, it's great. I really enjoyed using it and am looking forward to acquiring a tub or two of my own. I was sent an unscented version to test. It is a soft soap, not quite a croap, but close. Softness aside, a lot of product goes along way, with a 40-60 second load with a damp brush and light touch being sufficient for 3 passes plus extra. It generates a very rich, dense lather, takes an average/moderate amount of water (definitely not thirsty) and is easy to work with. Cushion and slickness are great. 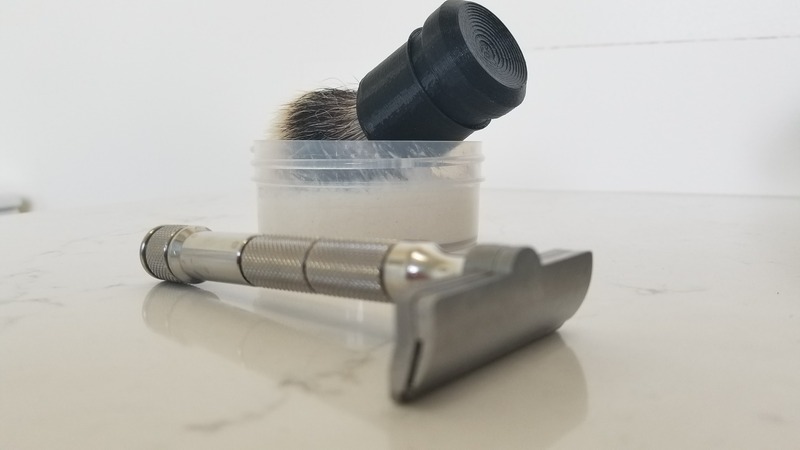 I used it with a few aggressive razors that I was trying out for the first time and it definitely provided great protection. Residual slickness (after first pass and rinsing) is excellent. I don't think I've used a soap with this level of residual slickness and slickness in general. It's simply great and makes the shave very smooth. Post-shave? I usually use witch hazel and a balm after every shave. For this trial period I skipped these to test the post shave. It is very nourishing... for the first few hours after the shave it almost felt as if I had applied my usual balm. For me, Glide + Citron would be a match made in heaven, stockpile worthy. I am anxiously awaiting the release to see what scents make it into the Glide line up. (11-19-2017, 09:11 AM)wreck | fish Wrote: I was lucky enough to be a tester for this soap. Here are a few thoughts for those wondering about this next release. Scents are up on the blog. Cool names but the scent profiles didnt jump out at me. Thanks for that. I missed it. I like Clary sage so I think madman will be in my cart! sounds wonderful.. But definitely more like a croap than a true cream? A tallow CRSW cream would make it instant legendary status. I am grateful to have had the opportunity to test the new soap base. Thanks to Larry for allowing such an organic review process. There is a lot of confidence in providing a new formula without a whisper of what’s new, and asking for feedback. As you’ll soon see, it was confidence will placed. My thoughts after a week with CRSW Glide, written prior-to/without reading any marketing material, knowing what to expect or even the name. While each release is an evolution, the improvements here are marked and easy to identify: slickness & post-shave, with what feels like even better protection. I generally shave daily, using four passes. During the trial week I alternated shaving every day, skipping a day, and started out with 3 days growth. The soap performed consistently throughout, so I won’t break it down day by day per-se. Slickness: measured by taking a finger down the cheek after face-lathering, during buffing, and after an entire pass is complete. Certainly the most notable improvement - very, very slick. With 3 days growth, the shave was smooth as butter. Residual slickness was excellent, particularly during buffing and when stretching the skin. Slickness was particularly long-lasting, still evident during the warm/cold water rinse at the end of the shave. Post-shave: I generally don’t have complaints so long as a soap isn’t drying. However, this new base does feel more nourishing than I expected - very similar to PannaCrema Nuavia. In fact, I used the leftover soap as aftershave prior to the rinse, al la Nuavia (e.g. The leftover lather was applied to my face & neck and left there while I cleaned the razor and brush, then rinsed away). There was tremendous residual slickness during this process, and my face felt thoroughly moisturized afterwards. Protection: I shaved slow, I shaved fast, I even used a heavy hand on occasion. Still, the alum block told me that the soap was quite protective. I’m used to this with CRSW, but there does seem to be an evolution in protection here. Lather general notes: very quick to create lather. I used dense badgers, a synth, and super-soft medium-density 2-bands. The soap took in copious amounts of water and retained it throughout the shave. Often, I’d add more water to the brush during pass 3 or 4, and the lather became even more beautiful, slick, and shiny. Overall, I experienced a substantial improvement for CRSW. I had excellent shaves - super easy to load and build into a dense, wet lather. I do load a lot of product, and for heavy hands like mine - you can back off a bit (it loads fast). This base has great post-shave properties, you may consider using it as an aftershave prior to your final rinse as I did. The last time Larry released a product, I remarked that it was amazing that they could continue squeezing more magic into these formulas. This has been a year well spent for CRSW; the improvements in slickness and post-shave are genuinely next-level. I just read the scent notes of the three planned Glide releases and if I'm honest I'm disappointed. There are notes in all three that do not agree with my nose. I was hoping that Bergamot & Bay (or even unscented) would be one of the releases since I REALLY want to try this soap. I kinda think the three scents look nice. And original. I'm just waiting to see the ingredients list. Im curious to read what's in the ingredients. It may be something that is more compatible with my skin vs the goat milk/tallow formulas. I love Oliva soap! It is softer than the current Select Formula. There is no problem loading off the puck as long as you use a reasonable touch when loading. I really really hope Larry will continue taking orders for unscented versions and that his new base is super sensitive skin friendly. Hoping for no lanolin. (11-19-2017, 12:42 PM)Nero Wrote: I kinda think the three scents look nice. And original. I was also a tester and I thought of you the moment I read the ingredients list...no lanolin! Excellent!!! I might just have to order all 3 then!